You'll have to excuse my next few posts; they haven't had the chance to catch up to my current hair color! I felt very space age-y in this little getup with lots of metallic silver, fresh whites, and a mock turtleneck. This look was completed with some double-jointed elbow action going on in the second to last photo, haha. Killer dresses with high collars and completely sheer sides are an obsession of mine; wear a simple black bra and some hot pants underneath and people won't know WHAT hit 'em. This Is A Love Song dress. Metallic silver backpack (similar here). Love the way you styled this outfit and your hair looks beautiful! 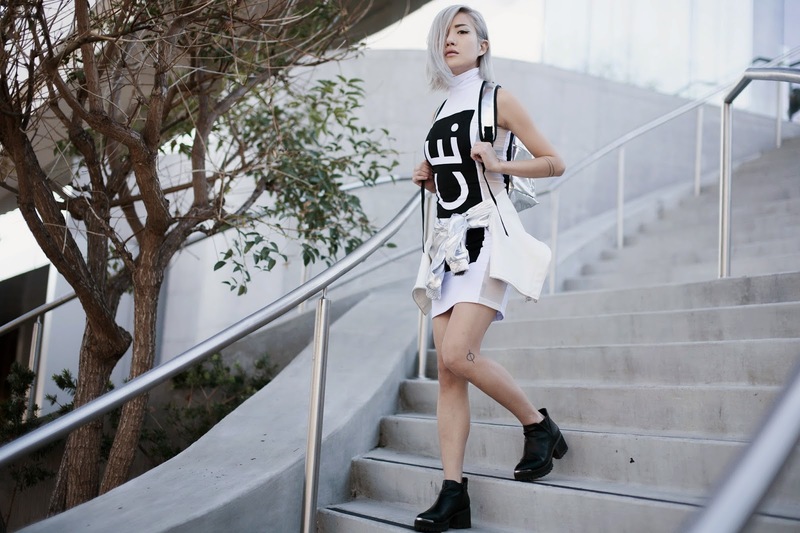 Love how sci-fi this outfit is - the dress, bomber and backpack are all so drool worthy! Silver backpacks are so cute, I've been wanting one for ages now! This is a fabulous outfit. love the way you have made the slick of silver work with matte white & black. And your hair compliments it all. Love!! The first pose goes so well with what you named this outfit! Gorgeous outfit! The sheer panel on that dress is amazing! Love this outfit. So futuristic! Awesome dress, you look awesome! Gorgeous outfit, i love your hair! Stunning look! love your bag. best outfit. I love that backpack so much! Such a great outfit. nice pair of shoe! I NEED that backpack and those boots! The thirst is real!